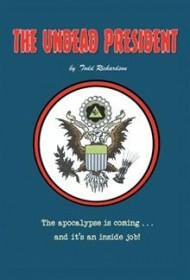 Author Todd Richardson’s otherworldly techno-thriller, The Undead President, brings the gruesome concepts behind AMC’s The Walking Dead to the White House. The novel opens with a bang as President Alex Holden is gunned down in Boston by a member of a revolutionary fringe group known, alternatively, as the Free Reign Movement by its members and the Dark Cloud Militants by the authorities. When Holden dies on the operating table, his advisors are stunned. But his brother, now head of the National Security Agency, brings in research scientist Dr. Ran Kudzan to administer a secret experimental formula that reanimates the President’s dead corpse, turning him into a ghoulish, if functional, zombie. It’s slowly revealed that before his untimely demise, the President was planning to change the world by fighting a proxy war with Japan in Indonesia. But now an increasingly ghastly President Holden — his decomposing face caked in macabre makeup— uses the formula to turn the Secret Service into an army of undead loyalists who will infect the world and quell resistance. “How thin the line between the normal and the surreal, how short the path from the familiar world of the routine and mundane to an alien landscape…,” Richardson writes. Three unrelated women become the base of living resistance against this vile monster, including Grace Livy, a spunky young TV reporter; Maritza Vanez, the Latina Vice-President; and June Holden, the First Lady of the United States. Despite an opportunity to offer readers some gory humor, the novel is straight-laced, treating its global conspiracies, political theater and investigative bravado with a weighty solemnity that more often uses exposition over action to laboriously explain events to readers. Still, Richardson’s writing is serviceable for its subject matter and several action-packed set pieces pick up the pace toward the last half of the story. Ultimately though, this talky thriller is probably better suited to fans of TV’s The West Wing than Reanimator or World War Z.